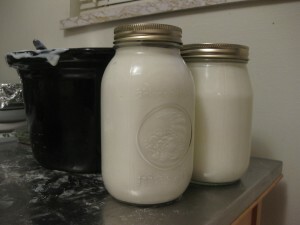 For some time now Chris and I have been making our own yogurt. It’s not that it’s cheaper – it might be, but we’ve not run the math to figure it out. I think it mostly started out as an experiment. We heard it could be done, so we tried it out. Much like making broth out of our old veggie scraps. It’s not hard, but it does always lead to a bit of clean up, including having to wash the crockpot (always a pain). But we continued the experiment in large part because it cuts down on waste, we like that we know what’s in it, and we can control our portions a bit better than with the store bought individual containers. See, Chris eats yogurt every day as a snack. In the summer I was eating yogurt almost every day for breakfast. That’s a lot of containers, even if you buy the large ones and make sure to reuse/recycle. We don’t have local recycling pick up so having a ton of containers is kind of a pain to trip over in our closet until we finally get to take it to the the center (yes we’re lazy in that way). Less waste AND less fighting with garbage bags of recyclables? Count us in. I usually went with vanilla, and Chris tried a variety of low-fat fruit flavors. When we looked at the ingredient list for those, it wasn’t horrible, but it definitely wasn’t the best. Then I went on a jam making spree this summer, and needed good ways to put it all to use. Plain yogurt with jam was the next logical step. And all of it would come from our kitchen. Neat! It took us a bit and a lot of comparing recipes, but we finally found a way that worked best for us. We make it in a crock pot, and let it incubate over night so we don’t have to worry about not disturbing it. If you want to try it out, be prepared to do some tweaking of your own to get it just how you like. 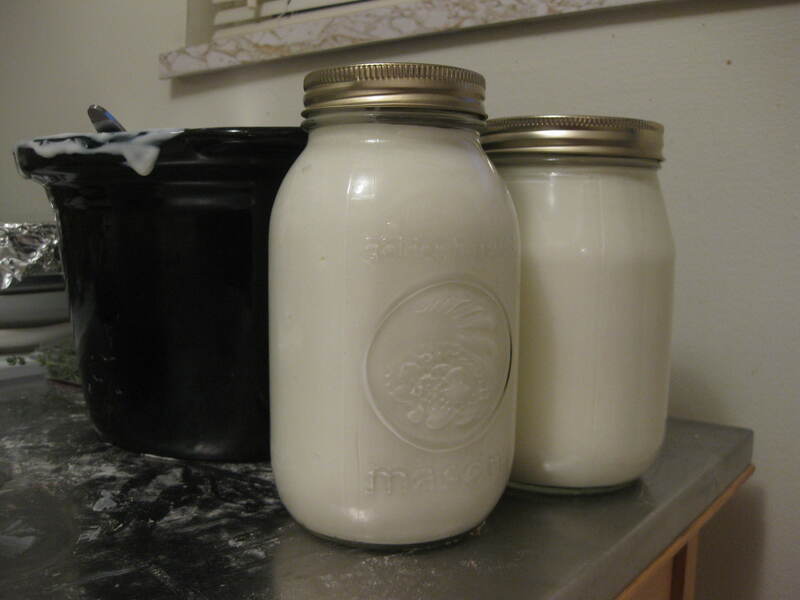 The basics are simple, heat milk, cool milk, add some yogurt and let it do its thing. 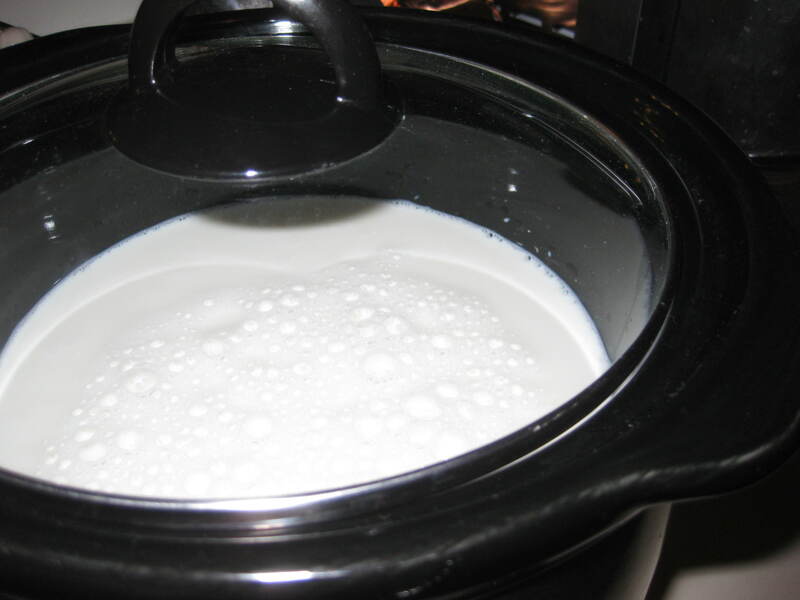 First, put 8 cups (1/2 gallon) of milk in your crock pot, cover and set it to high heat. We usually use whole milk, because I heard that was the best to start with and we’ve not found any reason to change it (yet!). Once the milk is in, get your thermometer ready! In a lot of cases you don’t need a thermometer to complete kitchen tasks, but this is one case that it’s actually necessary since there’s a smaller margin of error for it to turn out right. 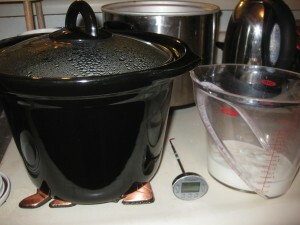 Let the yogurt do its thing and check the temperature periodically. You’re looking to get the milk to at least 180 degrees for a bit to kill off all of the bad stuff. We’ve sometimes let it go too long and gotten it hotter, and it’s still worked out fine, but that’s your target range. It usually takes us around an hour and a half to two hours for it to get to this point. Once you’re at the right temp, take the liner out of the crockpot itself and set it somewhere to slowly come down in temperature. 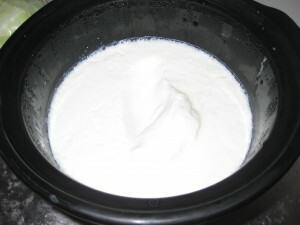 While it’s cooling, measure out a half of a cup of plain yogurt and let it come to room temperature. 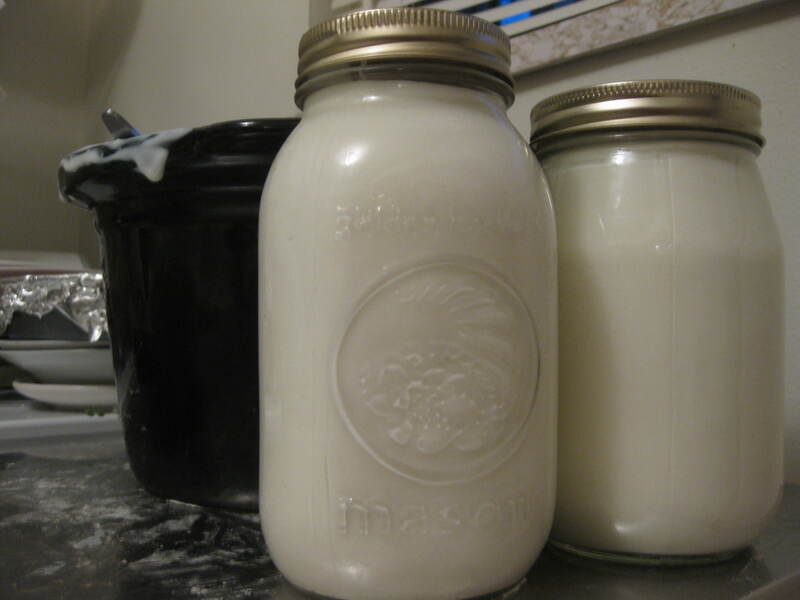 That is about a regular size container, or you can also use some from your last batch to keep the chain going! You need the milk itself to cool down to 110-112 degrees. It can’t be any hotter than that or it’ll kill off all the good bacteria so they won’t be able to do the yogurt making thing. That takes around 2 hours for us, depending on how cold our house it at the time. I’ve read that you can speed this up by putting it in a cold water bath, but we’ve never really felt the need. Once it’s come down to the right temperature, ladle out some of the milk into your measured yogurt and mix them together to incorporate it more evenly. Put the yogurt mixture back into your crockpot liner, stir thoroughly and cover again. Next, and this is where techniques vary, put on your oven light and put your milk-soon-to-be-yogurt inside. We don’t have a picture of that, because, well, the inside of ovens are really, really dirty – especially ours. (Note to self, clean oven). If you have a gas stove, you should be able to just leave the pilot light lit? At any rate, the idea is that you want to maintain a constant temperature, but you don’t want it to be too hot or else it kills the bacteria off. The oven light or the pilot light should keep it just warm enough. If it doesn’t work for you with the oven light, you might need to turn on the oven for just a bit and let it cool down some. Once it’s shut it’ll keep the heat in. We tried that and it was too hot, so it takes some experimentation. Want to skip the oven all together? Crockpot 365 gives you an alternative method, but it was too much of a pain for us to try. How long you leave it in there unattended depends on how tangy you like your yogurt. Remember, it’s a plain yogurt so it’s supposed to have a bit of a tang. We’ve let it go for only 6 hours before and that was not enough. 8 hours tends to be too much, even when sweetened with jam. Somewhere around 7 hours is ideal for us, but, again, you’ll need to do a couple batches to determine your preference. When you take it out in the morning, check the thickness and see that it’s thicker like yogurt. Do not be tempted (and you will be) to mix it up because you want it to set up a bit more. Go ahead and put it in the refrigerator and forget about it for the day. That evening it should look something like this. To eat, we put a small portion (less than those cups you buy) into a dish and put in a tablespoon or so of jam. You can also add vanilla or honey, whatever strikes your fancy. The most important part is that you enjoy! Is it worth it? It may or may not be for you, depending on how much yogurt you eat. Now that we have the technique down it’s much less of a hassle than it was before, so we really enjoy having it around.